Most National Science Foundation Coupled Human Natural Systems projects entail graduate training. This chapter discusses the complex terrain of training and mentorship for collaborative research that crosses disciplinary, transdisciplinary, and cultural/geographic boundaries. We argue that the training process itself entails many boundary-crossing challenges within the academic environment. We use as a case study the Integrative Conservation Ph.D. program at the University of Georgia, a unique program dedicated to advancing interdisciplinary and transdisciplinary research in conservation and sustainability. We draw parallels to the thematic issues that cross-cut the contributions to this volume, and explore effective pedagogical innovations, organizational strategies, pitfalls, and insights for crossing intra-academic boundaries to provide Ph.D. training for the next generation of boundary-crossing scientists. The ideas and views herein were inspired by stimulating collaboration and camaraderie with many individuals associated with the ICON Ph.D. program and the Center for Integrative Conservation Research (CICR) at the University of Georgia. Pete Brosius, Laura German, Nik Heynen, Cathy Pringle, Jenn Rice, and Meredith Welch-Devine have been at the core of ICON efforts, and many other ICON and CICR Affiliates have contributed immensely. We thank all the ICON students, who continue to the shape of the program through their experience and thoughtful feedback. We thank UGA’s leadership (deans and staff at several levels) for their generous support, guidance, and patience through the cross-boundary challenges. We also thank Talley Vodicka, for her expert program support, feedback, and intellectual contributions in all ICON endeavors. King extends gratitude to her collaborators at the intersection of ICON, CICR, and an NSF-sponsored CNH research project: Laura German, Ryan Unks, and Gabriele Volpato. Their project was supported by the US National Science Foundation (Grant No. 1313659) and conducted with permission of the Government of Kenya (Permit NCST/RRI/12/1/MAS/108). 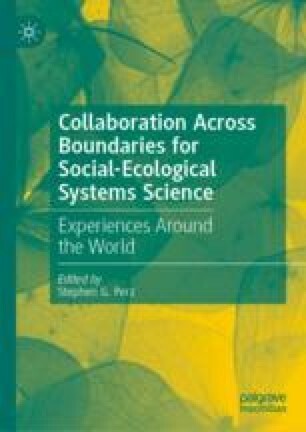 We also thank Arun Agrawal for the invitation to participate in the symposium at the 2017 Association of American Geographers meeting, which led to this edited volume, and Stephen Perz for spearheading its preparation. Epstein, A. W., & Stein, A. (2014). Rivers and Dams: A Multiplayer Role-Play Game That Promotes Learning in Collaboration and Team-Oriented Communication. Seventh Symposium on Engineering and Liberal Education, Union College, Schenectady, NY (abstract available at https://cpb-us-w2.wpmucdn.com/muse.union.edu/dist/e/218/files/2014/2007/2014-ELE-Symposium-Program.pdf, p. 2021). Weissmann, J. (2013). How Many Ph.D.’s Actually Get to Become College Professors? The Atlantic. Retrieved from https://www.theatlantic.com/business/archive/2013/02/how-many-phds-actually-get-to-become-college-professors/273434/.